Asked if it was an issue he planned to be active on in the Senate, Romney said that he intends "to be active in everything I can be active in" after he takes his post. 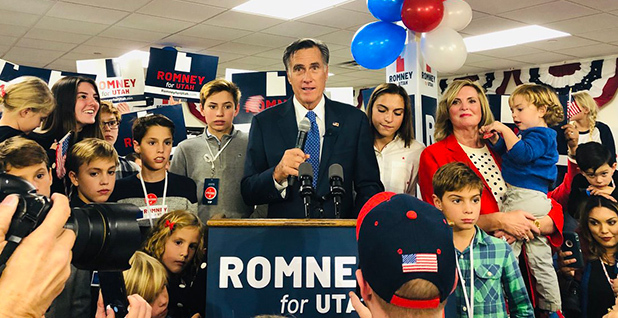 Romney, a 2012 Republican presidential nominee who easily won his race to replace outgoing Sen. Orrin Hatch (R), has swung on the issue of greenhouse gas emissions for years. As governor of the blue state of Massachusetts, he pushed to close old coal-fired power plants and helped create the Regional Greenhouse Gas Initiative — essentially a cap-and-trade plan — in the Northeast (Climatewire, Nov. 8). He has also long advocated increased oil and gas production in an effort to increase U.S. energy independence, including drilling in Alaska's Arctic National Wildlife Refuge. As a presidential candidate in a competitive GOP primary, Romney took a modified tone, shifting some of the dialogue to questions of economics as opposed to science. "My view is that we don't know what's causing climate change on this planet. And the idea of spending trillions and trillions of dollars to try to reduce CO2 emissions is not the right course for us," he said during a 2011 fundraiser, according to ABC News. But for the past six years, the Republican has been fairly consistent in emphasizing climate change as an urgent problem that humans contribute to and demands action.